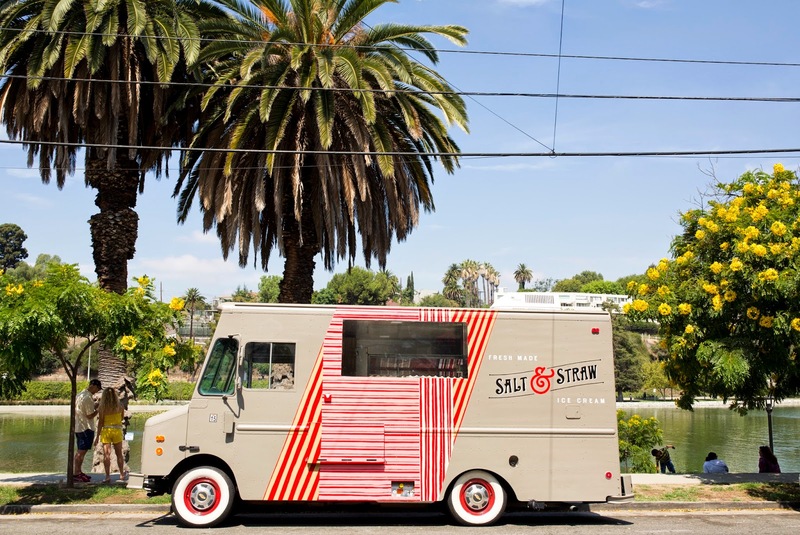 THE UNEMPLOYED EATER: We Should All Scream Because Salt & Straw's Scooping FREE on Valentine's Day in Brentwood. We Should All Scream Because Salt & Straw's Scooping FREE on Valentine's Day in Brentwood. No doubt about it, Rose City ice creamery, Salt & Straw has been an unequivocal success since opening their first Golden State location on Larchmont late last year. Heck, their Salted, Malted Chocolate Chip Cookie Dough made my Top 14 of '14 after only one taste. Many on the westside though, hampered by traffic and kids and work and life, have yet to experience the lusciously velvety goodness. Salt & Straw wants to change that. For Valentine's Day, S&S will park their ice cream truck out front of Brentwood chocolate sanctum Compartes from 1-3 pm and will be doling out FREE MINI-SCOOPS of two of their February seasonal flavors. Part of an overall chocolate-based February special menu, the two pro-bono flavors on offer both feature the aforementioned Compartes. Note to male people out there: you should already be going to Compartes on V-Day, so now you get a free scoop as a reward for not buying her CVS chocolates she'll pretend to like, but actually really, really loathe. Can't make it to Compartes? You're in luck! The Salt & Straw February Chocolatier Series consists of four all chocolate-based ice creams, all of which came about via collaboration with notorious California artisanal chocolatiers. Besides the two Compartes flavors, the Larchmont shop will also feature one flavor each from Santa Barbara's Twenty-Four Blackbirds and Chocolate Maya from January 30th until March 5th. 912 S. Barrington Avenue, Brentwood. Essay writing services are the best custom writing service with over 8 years in this field by giving good essay papers. Every paper at buy essays is written according to the top college's standards. Our good native English speaking writers write the essays in a given frame of time. Learning students all over the world are looking for cheap services in terms of good service that will walk with them through the school or college tasks. Students expect to get unique content at cheap prices. Our services give top essay writing service with good quality. We do not use used paper, copy-paste from any other sites or under deliver. Most of the teachers do not wish to see their students handing a copied essay paper. In order to avoid this, our service gives genuine papers at very cheap prices. For every order, you will receive a plagiarism report and a grammar search for research. We believe that handing over the paper within time is the best method any service would like to do. Our writers are able to work at any tough times. Every research is unique. It is unique in terms of writing, style, editing. All papers are custom written according to the student’s interest. We have an expert to assist you in any fields. We know that our customer is the king, and we are the servants and so we must deliver no matter what. The effort in delivering papers is the base behind a number of clients. Students can score good grades if they submit a good essay paper. Teachers will be impressed if they submit good essays. Hiring a professional to write an essay is the best decision any student can make in life. If a student hands over essays to these services they can sit back and relax with their family members. Our main aim is to satisfy the customers.